Posted August 28, 2018 by Miles Gopie & filed under Newswire, The Tech. 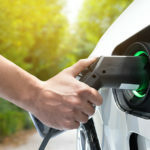 Solid-state batteries are theoretically safer, more stable, and have higher energy densities than conventional Li-ion batteries with liquid electrolytes. Unfortunately, they also tend to have relatively high resistance at the interfaces between their electrodes and solid electrolytes, which can limit the rate of charging and discharging. In order to solve this, researchers from the Tokyo Institute of Technology and Tohoku University used high-vacuum fabrication to greatly diminish impurities and resistances at these interfaces. The study used X-ray diffraction and Raman spectroscopy to analyze a new compound that can potentially provide higher voltages than conventional materials. In the end, electrochemical impedance spectroscopy revealed that the interface resistance was 7.6 Ωcm2, two orders of magnitude less than other LNMO all-solid-state batteries, and even less compared to liquid-electrolyte LNMO batteries. There was no performance decrease after 100 cycles, and the batteries were capable of both fast charging and discharging. The (a) charge-discharge curves and the (b) cycling performance plot show that the performance of the fabricated all-solid-state batteries did not degrade after repeated use, demonstrating their stability and the total reversibility of the reactions involved in charging/discharging. The promise of Solid state batteries. Sounds like progress….